All We Know Is Falling is the debut studio album by American rock band Paramore, released on July 26, 2005 under the Atlantic-distributed Fueled by Ramen in the United States. The production was led by James Paul Wisner, Mike Green, Nick Trevisick, and Roger Alan Nichols. All songs were written by vocalist Hayley Williams and guitarist Josh Farro. 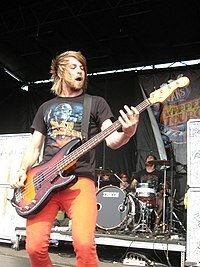 The departure of bassist Jeremy Davis, which occurred a few days after arriving in Orlando, served as the album's main theme. This theme was reflected especially in the album's cover and title. Mostly categorized as a pop punk album, the album received mostly positive reviews and has been labeled a "scene classic". The album's production took place in Orlando, Florida. Instead of making a major push towards radio, the band's A&R recommended that the band build a fanbase through word of mouth. Initially, the album received mixed reviews by music critics, however, praised the voice of Hayley Williams. The album had a weak domestic commercial performance: it failed to enter the Billboard 200, though it did reach number 30 on Billboard's Heatseekers Chart. It reached No. 4 on the UK Rock Chart, and in 2010 it managed to reach No. 51 on the UK Albums Chart and earned a gold certification by the BPI. In July 2014, after the group found success with its following records, All We Know Is Falling received gold certification from the Recording Industry Association of America (RIAA). Three singles from the album were released: "Pressure", "Emergency" and "All We Know". None of the singles managed to reach any major chart, although "Pressure" was certified gold by the RIAA in 2016 after the band found commercial success with subsequent releases. Hayley Williams was originally signed to Atlantic Records in 2003 as a solo pop singer. However, Williams resisted the label's solo-career wishes, saying she did not envision herself as "the next Madonna". As a result, she formed Paramore with Josh Farro, Zac Farro, and Jeremy Davis. In her short solo career, Williams recorded some demos, which were later re-recorded with the band for a "more authentic" sound. However, the band was almost fired because the label thought they "were terrible." Williams and Farro wrote two new songs, "Here We Go Again" and "Hallelujah", which saved the group from being fired. The former song became the fifth track on All We Know Is Falling, while "Hallelujah" was saved for their sophomore album Riot! (2007). The departure of bassist Jeremy Davis served as one of the themes for the album. The group traveled to Orlando, Florida to write and record the remainder of the album. A few days after arriving in Orlando, Davis left the band. The remaining members continued work on the album. The band decided to base the album's theme and around Davis' departure. According to Williams, the album's cover art also represented Davis' departure: "The couch with no one there and the shadow walking away; it's all about Jeremy leaving us and us feeling like there's an empty space." The album's artwork was created by Electric Heat. The album's recording process took about three weeks, with Josh Farro calling the sessions "rushed". "All We Know", "Never Let This Go" and "My Heart" were recorded with producer James Paul Wisner at Wisner Productions, located in St. Cloud, Florida. "Pressure", "Emergency", "Brighter", "Whoa", "Conspiracy" and "Franklin" were recorded with producer Mike Green at ARS Studios, located in Orlando, Florida. "Here We Go Again" was recorded with producers Roger Alan Nichols and Nick Trevisick at Bigger Dog Studio, located in Franklin, Tennessee. Additional recording took place at Stone Gables Studio, located in Brentwood, Tennessee and at The Skyview Church of Tone and Soul, located in East Nashville, Tennessee. All of the songs were mixed by Green, except for "Here We Go Again", which was mixed by Nichols and Trevisick. Tom Baker mastered the recordings at Precision Mastering in Hollywood, California. Nath Warshowsky acted as the studio drum tech for every song, except for "Here We Go Again". Dave Buchman engineered "Here We Go Again". Lucio Rubino, formerly of StorySide:B, replaced the absent Davis in the studio. He performed bass on every song except for "Here We Go Again", which was done by Jeremy Cadwell. Typically, Farro would write the music while Williams wrote the lyrics. On occasion, Farro would contribute lyrics as well. "Conspiracy" was composed by Williams, Farro, and Taylor York. It was the first song they wrote together. Many of the lyrics in All We Know Is Falling which are not related to Davis' departure deal with the bad relationship and divorce of Williams' parents. The band's influences varied in sound during the album's recording. Williams claimed influence from metal bands Underoath and Failure, and from pop rock band The Academy Is... Davis said the band were heavily influenced by Slipknot. Critics have variously called All We Know Is Falling a pop punk, emo, or pop rock album. Trevor Kelley at Alternative Press categorized the music on the album as "vaguely emo, but mostly mall-punk". Tom Whitson of Click Music defined the music on the album as emo with "pop-punk beats", drawing comparisons from Avril Lavigne and Fall Out Boy. The Allmusic review by Neil Z. Yeung referred to the album as a "formulaic" pop punk album, complete with "head-bobbing drums, straightforward riffs, and a midtempo sameness throughout". In a retrospective Alternative Press review by Tyler Sharp, the album was referred to as what would have been "just another pop-rock effort that ultimately fell short in the face of its true potential" if not for the band's later success. Gigwise reviewer David Renshaw also drew comparisons to Lavigne, but believed that the songs on the album were inferior to those of Lavigne's. Hayley Williams performing on July 4, 2006 in Phoenix, Arizona as part of the 2006 edition of Warped Tour. Paramore released All We Know Is Falling on July 26, 2005 in the United States. According to Paramore's A&R at Atlantic Records, Steve Robertson, the promotion strategy behind the album was that the band would start small and slowly build through word of mouth instead of giving the debut album a major radio promotional push. In his own words, Robertson "wanted kids to discover the band without it being shoved down their throats." In September 2005, a special Japanese edition containing a previously unreleased song "Oh Star" was made available. In January 2009, the album was released on vinyl for the first time. On May 19, 2009, a deluxe edition of the album was released exclusively on iTunes with live versions of "Pressure" and "Here We Go Again", and the music videos for all the singles. A 10th anniversary edition of the album was released on December 4, 2015 on vinyl, which contains "O Star" and "This Circle" as bonus tracks; this version was limited to 4,000 copies. The album featured three singles: "Pressure", "Emergency" and "All We Know". Two weeks before starting a tour to promote the album, John Hembree joined the band to replace bassist Jeremy Davis, though Davis ended up rejoining the group after five months away from the band. In December, the band supported Funeral for a Friend on their headlining tour in the United States. In February 2006, the group went on Midwest and east coast tour with Halifax, My American Heart, and So They Say. Through the spring of 2006, Paramore was an opening act on tours for both Bayside and The Rocket Summer. The band was initially planned to appear on the 2006 edition of the Take Action Tour in early March 2006, but Williams came down with flu, which resulted in the band being replaced by Sullivan. The band went on the 2006 edition of the Warped Tour, which took place in Nashville, near the group's hometown. In August and September, the band headlined a tour in the US with support from Hit the Lights, Cute Is What We Aim For and This Providence, followed by some dates in the United Kingdom in October. All We Know Is Falling was met with generally mixed to positive reviews from music critics. Kelley stated "it's obvious that someone has done Williams wrong" from the lyrics in the album's the songs, and noted its similarity to Lavigne's previous studio album Under My Skin (2004). Tony Pascarella of The Trades said that "these passionate, rocking tracks are what make this Tennessee group so talented [...] Paramore is a band you may not yet have heard of, but look for them to make a major splash in the very near future." He also praised Williams' voice as "a rich, powerful voice that rarely makes a mistake on this stunning debut." In a tenth-anniversary review from Alternative Press, Tyler Sharp wrote that the album evolved into "a scene classic" after the band's gradual rise to mainstream popularity in later years. In a retrospective review, Yeung showed mixed feelings about the album. He regarded the album as "alright", however, he believed that the songs were too straightforward and lacked "differentiation, excitement, or the brightness that would be found on later albums." Whitson said that the album was "this group of youngsters have written a great debut album for their age [...] [All We Know Is Falling] isn't the best album around, but is far from the worst." Renshaw was critical about the fact that "Paramore are for the kids who think Pink is not cool enough but My Chemical Romance are too scary, they want to rebel but they have to be in by 9 o' clock. Paramore are not terrible; they are simply a transitional band." Jordan "Anchors" Rogowski from Punknews.org was more critical of the album; he praised Williams' voice, but criticized the structures of the songs, regarding them "just too flat, too linear [...] the guitar seems a bit uninspired, the drumming a bit lazy, and the bass is barely existent, if existent at all." Initially, All We Know Is Falling only charted on the Billboard Heatseekers Albums chart, peaking at number 30 in September 2006. After the success of their second studio album Riot! (2007), the album sales gradually built. Although it never charted on the Billboard 200, it did manage to take number eight on the Billboard Catalog Albums chart in 2009. All We Know Is Falling only reached number 51 on the UK Albums Chart, but still received gold certification in 2009 by the British Phonographic Industry for shipping over 100,000 copies. It was then certified in Australia in 2012, where it went gold for shipments of over 35,000 units despite never reaching an Australian chart. In 2014, the album was certified gold in the United States for shipments of over 500,000 copies. Initially, none of the singles managed to chart, but after the success of Riot!, "Pressure" was able to peak at number 62 on the Billboard Digital Songs chart. In 2016, the recording was certified gold by the Recording Industry Association of America (RIAA). Credits adapted from the album's liner notes unless noted. All lyrics written by Hayley Williams, except where noted. All music composed by Hayley Williams and Josh Farro, except where noted. All tracks produced by Mike Green, except where noted. 5. "Here We Go Again"
^ In the UK, "Pressure" was released as the second single on October 30, 2006. ^ In the UK, "Emergency" was released as the lead single on August 21, 2006. ^ "All We Know" was released on iTunes in 2006. ^ a b c "American album certifications – Paramore – All We Know Is Falling". Recording Industry Association of America. If necessary, click Advanced, then click Format, then select Album, then click SEARCH. ^ Christian, Kat (October 29, 2006). "Paramore - Pressure". Rocklouder. Archived from the original on March 4, 2016. Retrieved January 20, 2017. ^ Diver, Mike (August 24, 2006). "Paramore: Emergency". Drowned in Sound. Archived from the original on October 2, 2009. Retrieved January 20, 2017. ^ "Paramore". iTunes. Archived from the original on December 18, 2009. Retrieved January 20, 2017. ^ a b "Paramore - All We Know". Allmusic. Retrieved August 7, 2016. ^ "Interview with Jeff Hanson". HitQuarters. September 20, 2010. Retrieved October 7, 2010. ^ "Band - Paramore". Paramore's official website. Archived from the original on May 10, 2008. Retrieved December 31, 2007. ^ a b Karan, Tim (December 22, 2010). "Josh Farro "finally tells the truth" about Paramore". Alternative Press. Archived from the original on 2016-05-20. Retrieved August 7, 2016. ^ a b Hayley Williams; Josh Farro (August 8, 2005). "Interview: Hayley Williams and Josh Farro of Paramore". The Trades (Interview). Interviewed by Tony Pascarella. Archived from the original on February 13, 2007. Retrieved August 16, 2007. ^ a b c d e f All We Know Is Falling (Booklet). Paramore. Fueled by Ramen. 2005. FBR076. ^ Conny, Julia (May 25, 2007). "Paramore - 05.25.07". AbsolutePunk. Archived from the original on July 17, 2012. Retrieved August 8, 2016. ^ Biography Today. Detroit, Michigan: Omnigraphics. 2010. p. 107. ISBN 978-0-7808-1059-4. ^ "To Truly Understand the Chain of Events". Alternative Press (235): 102–104. February 2008. Retrieved August 8, 2016. ^ a b "Interview with Paramore". EuroPunk. July 14, 2006. Archived from the original on April 13, 2009. Retrieved August 8, 2016. ^ a b c d Yeung, Neil Z. (July 25, 2005). "All We Know Is Falling - Paramore : Songs, Reviews, Credits, Awards". AllMusic. Retrieved April 26, 2013. ^ a b c d e Kelley, Trevor (October 1, 2005). "Paramore - All We Know - Alternative Press". Altpress.com. Retrieved April 26, 2013. ^ a b c d e "Paramore - All We Know Is Falling". Click Music. Archived from the original on May 12, 2015. Retrieved June 6, 2015. ^ a b c d Sharp, Tyler (July 26, 2015). "Paramore's debut album, 'All We Know Is Falling,' turns 10". Alternative Press. Retrieved August 7, 2016. ^ a b c Renshaw, David (April 24, 2006). "Paramore - All We Know Is Falling Released 24/04/06". Gigwise. Archived from the original on January 21, 2017. Retrieved January 21, 2017. ^ Blumentrath, Jan (November 9, 2009). "Interview With Paramore A&R Steve Robertson" HitQuarters. Retrieved December 30, 2016. ^ a b c "All We Know Is Falling by Paramore" (in Japanese). Amazon.com. June 24, 2009. Retrieved November 2, 2011. ^ "Paramore release All We Know Is Falling on vinyl". Alternative Press. Alternative Press Magazine, Inc. January 25, 2009. Retrieved July 31, 2017. ^ a b c Payne, Chris (November 13, 2015). "Paramore's Debut Album Is Getting Reissued on Vinyl With Bonus Tracks". Billboard. Retrieved August 10, 2016. ^ "Paramore - Pressure". Allmusic. Retrieved August 7, 2016. ^ "Paramore - Emergency". Allmusic. Retrieved August 7, 2016. ^ Schleweis, Jason (July 14, 2005). "Paramore Interview - 07.14.2005". Crush Music Mag. Archived from the original on July 19, 2011. Retrieved August 7, 2016. ^ "Paramore Kerrang! Article". Kerrang!. 2006-11-05. Archived from the original on May 27, 2012. Retrieved October 13, 2007. ^ UG Team (October 14, 2005). "In Brief: Funeral For A Friend, Collective Soul, Thrice, Story Of The Year". Ultimate Guitar. Retrieved April 2, 2018. ^ "Halifax, Paramore, My American Heart, SoTheySay to tour". Alternative Press. January 20, 2006. Retrieved June 27, 2016. ^ Spin Staff (March 1, 2006). "Spotlight - Bayside" Spin. Retrieved August 5, 2016. ^ "Chiodos, Roses Are Red on Take Action! '06; dates announced". Alternative Press. January 4, 2006. Retrieved June 26, 2016. ^ "Sullivan replacing Paramore on Take Action! Tour". Alternative Press. March 7, 2006. Retrieved July 19, 2016. ^ "Warped Tour confirms tour routing, venues, more bands". Alternative Press. March 2, 2006. Retrieved July 19, 2016. ^ "Paramore postpone two U.S. shows, drop off Reading/Leeds". Alternative Press. August 22, 2006. Archived from the original on 2016-08-22. Retrieved August 4, 2016. ^ a b Rogowski, Jordan (January 8, 2006). "Paramore - All We Know Is Falling (2005)". Punknews.org. Retrieved June 6, 2015. ^ a b Pascarella, Tony (July 20, 2005). "Music Review: Paramore, "All We Know Is Falling"". The Trades. Archived from the original on June 15, 2013. Retrieved April 26, 2013. ^ a b "All We Know Is Falling - Paramore (2005)". Billboard. Nielsen Company. Archived from the original on January 22, 2011. Retrieved August 9, 2016. ^ a b "British album certifications – Paramore – All We Know Is Falling". British Phonographic Industry. Select albums in the Format field. Select Gold in the Certification field. Type All We Know Is Falling in the "Search BPI Awards" field and then press Enter. ^ a b "ARIA Charts – Accreditations – 2012 Albums". Australian Recording Industry Association. ^ "Paramore - Chart History (Digital Songs)". Billboard. Nielsen Company. September 1, 2007. Retrieved August 7, 2016. ^ "Gold & Platinum - RIAA". Recording Industry Association of America. Retrieved January 14, 2017. ^ a b ACE Repertory. Retrieved June 5, 2017. ^ "Paramore | Artist". Official Charts. Retrieved June 18, 2013. ^ "Official Rock & Metal Albums Chart Top 40". Official Charts. January 9, 2010. Retrieved January 20, 2017. ^ "Paramore - All We Know Is Falling CD Album". CD Universe. Retrieved February 2, 2017. ^ "Paramore All We Know Is Falling: CD Album". HMV. Retrieved February 8, 2017. ^ "All We Know Is Falling first by Paramore". Sanity. Retrieved February 6, 2017. ^ "All We Know Is Falling". HMV. Retrieved February 11, 2017.